The queen bee of the Women's 7-Series collection, the Rossignol Star 7 Skis have been a highly coveted weapon among hard charging ladies. With a 116mm waist, Powder Turn Rocker and patented Air Tip technology, the Star 7 Skis were born for unparalleled deep-snow fun with easy to handle maneuverability. Looking to ride some groomers in between runs? These wide-waisted beauties have camber underfoot and a centered sidecut that provide impressive edgehold performance on the hardpack. Sandwhich lamination and traditional sidewalls ensure maximum durability. 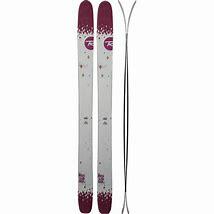 Show the ego-burdened boys how to really ski some pow this winter with the Rossignol Star 7 Skis.